Just a week after a stunning victory at the ITU World Triathlon Series San Diego, Great Britain’s Alistair Brownlee was back in racing action again late Sunday evening (U.S. time…), but this time with no swimming or cycling involved. Having expressed a desire to try out some new events in the post-Olympic year – and also expressed interest in running in the Commonwealth Games over 10,000m in Glasgow in 2014, Alistair took his first steps towards that by running the 10,000m at Stanford University. The Payton Jordan Invitational meeting was the event, and the result was a very good one, as Alistair took a close second in the race, crossing the line in 28:32.48. Towards the front of the race throughout, Alistair took the lead with a lap to go but was edged out for first place by Jose Antonio Uribe Marin (28:30.80). After last weeks win in San Diego, Brownlee widely expressed his belief that he wasn’t in top form yet, with limited training so far this year – and you would have to imagine that his performance there would have taking something out of his legs. How fast can he go? I guess we’ll see over the next 12 months. The controversial Commonwealth Games qualifying times from England Athletics are 27:50 (A- standard) and 28:10 (B-standard), but as we have noted previously, those marks were greeted with derision by many of the UK’s top distance runners, with only Mo Farah having beaten the A-standard last year with nobody else remotely close. Will 28:10 be required to qualify? Highly unlikely – despite the standards set, England Athletics have indicated that they intend on taking full teams, and so at this early stage of the qualifying process, Brownlee has at least put his first mark on the board with a time that I’m very happy to admit, was quicker than I expected he would manage – especially so early in the year and with San Diego in his legs. In 2012, only Farah and Andy Vernon (27:53:65) of British athletes clocked a faster time than Brownlee did today. In the 'A' heat today, Chris Thompson ran 27:40.81 to come within one second of the World Championship and Commonwealth Games A standard. 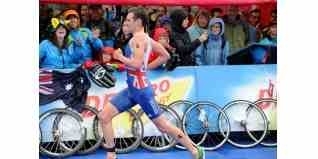 One thing is sure, Alistair Brownlee has made a few ‘runners’ take note of his abilities after that result. You can also watch Alistair's race here courtesy of www.flotrack.org.